Lot No 40 is a cheap rye whisky that was awarded ‘Best Canadian Whisky’ twice already (albeit at the Canadian Whisky Awards, first in 2013 and again in 2016 – funnily enough the year in which Jim Murray named the Crown Royal Northern Harvest Rye Best Whisky in the World in his (in)famous Whisky Bible. It is distilled in Windsor, Ontario, just a bridge distant from Detroit. The nose starts on spices and wood. Pine bark! Quite some cloves and some mint. The first prickle quickly disappears to make room for some sweet notes like milk chocolate and corn on the barbecue drenched in sweet butter. Not bad, but not earthshattering either. The wood dominates, which I think is a pity. The arrival is sweet and sour with again lots of woody notes. The pine tree returns. Quite herbal. Thym, cinnamon, ginger and cloves. Slowly evolves towards dark bread with sesame seeds. The corn on the barbecue evolves towards mildly salted popcorn, but the whole works. I would have liked this to be a tad sweeter though. The finish is more of the same with lots of spices and wood. At the death, the tannins take control, leaving your mouth dry. It probably me, but it is too dry, to woody and not sweet enough to enjoy neat. Lot 40 is not a cheap rye whiskey. It often matches Laprhoaig 10 in price. And the adjective "cheap" does nothing to help your review. Old Overholt is is cheap and can be quite good. OGD BIB and 114 are cheap and taste great. You mostly review whiskies that are very rare, like Serge. That's great. But that's not where most of us live. @markjedi1 Thanks for your review. Inasmuch as my fellow Connosrs and I often sing the praises of Lot 40 (and Dr Don Livermore), it’s not going to please everyone. Also, Lot 40 is not immune from batch variation. I found it interesting to note that it wasn’t sweet enough for you. I’ve always found some lovely vanilla and caramel notes in Lot 40 which scream VIRGIN OAK behind the spicy, herbal rye notes. Then again, I don’t like sweet whiskies, so maybe my “just right” is too dry for some. Vive la différence ! If the Internet is correct, the original Lot 40 (circa late 1990s) was the brainchild of then Master Distiller Mike Booth. It was an attempt by Hiram Walker to create three different premium whiskies known as the Canadian Whisky Guild. The success of these whiskies was limited, probably owing to the snobbishness of consumers when it comes to premium Canadian whiskies. 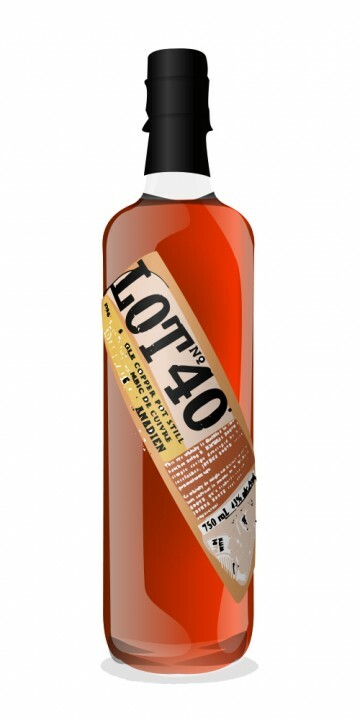 Lot 40 was discontinued, much to the chagrin of Canadian whisky enthusiasts. In 2012, Corby spirits (which had acquired Hiram Walker) re-released Lot no.40. To ensure that they weren't just selling a venerated name and capitalizing on the (recent) past, Master distiller Dr Don Livermore consulted with the retired Mike Booth to ensure the recipe was authentic. Lot 40 is produced in a single, 12 000 litre copper pot still at the Hiram Walker facility in Windsor, Ontario. Lot no. 40 won Canadian Whisky of the Year in 2015 (Canadian Whisky Awards) as well as Connoisseur Whisky Of The Year Multiple Markets and a Gold Medal in 2017 (Canadian Whisky Awards). So I guess you could say it's kind of a big deal. Adding water allows more complexity to shine through. Lot 40 may seem like a one-trick pony at first, but it deserves your full attention. With water, more herbal notes come through and some tobacco makes an appearance. There is also a citrus note that becomes more evident with water, perhaps oranges. This whisky is even great in an Old Fashioned tumbler on the rocks. Hey, not every whisky needs to be sipped from a Glencairn all of the time. Honestly, I like this whisky almost as much as Dissertation. Highly recommended. Weighting the nose 25%, the taste 35%, the finish 15%, and intrigue 25%, the overall score is 91. I have said that I like the 2012 batch more, which I rated 89...I still agree with my component percentages but I suppose this means that my rating scheme I have been using on connosr to test it out has yet to be tweaked. Weightings of 30/30/20/20 rather than 25/35/15/25 which I use on my blog are perhaps more representative of my actual score. On the note of ratings, I have also been noticing that in whisky I gravitate towards what is best, which often means that, in my mind, I naturally change my "weightings" to more heavily favor the best parts of the whisky - and perhaps I should tweak my scheme to reflect that. For instance, if I rate a whisky 90/85 on the nose/taste, I will enjoy it more than a whisky which is 87.5/87.5. In this batch, I found the nose not quite as expressive but the palate better than the 2012 batch, but in the 2012 the nose made the whisky in a similar way that the palate makes the whisky here, and not necessarily in equal parts each time...interesting. @JasonHambrey, thank you for the nice review, as usual. I have found the more recent iteration of Lot No. 40 to be somewhat muted or dialed-down when compared h2h with the 2012 edition. I had read somewhere that the newer release was approximately 12 years old; however, while speaking with Don Livermore recently, he mentioned the bond lot for this newer batch was 2005 and it would have been 9ish years in oak. I must say at this time the 2012 is more to my liking; it has a bit more of a rye-spice kick, but they are both very nice whiskies. With regard to the scores you have assigned to the two batches, and your stated preference being for the lower scoring (89)2012 edition, this is not uncommon - having a preference for the lower scoring expression....some whiskies just punch above their weight. This whisky was well regarded among whisky connoisseurs, until it disappeared roughly a decade ago. However, it was re-released in 2012 and was received very well - once again. It is a 100% malted rye whisky, distilled in a single copper pot still, aged in new charred wood which is pretty apparent when you smell the bold caramel and candied rye. Currently there is a bottling out without a year statement on it - I haven't had it, but I'd be interested to see how that batch compares. PS...how can a grade by 91 when all the components are less than such a score? a product of how I round my scores - I kept it the same for consistency and I don't mind such a score for a product like this one. Lot No. 40 2012 release. A "single copper pot still" Canadian whisky "made with malted rye". I have read that it is made of 90% rye grains and 10% rye malt, though I can't find official confirmation. I bought this bottle during a spirits sale at the Québec liquor store, the SAQ. Regular price: 40$CAD. Drunk neat. First glass from the bottle. Nose: Sweeter than I expected from a whisky made of rye. Caramel and vanilla with some mint and slightly spicy. Everything I expected from a Canadian whisky. Taste: It arrives soft and syrupy, with caramel up front as the nose promised. For the first few seconds, It reminds me a bit of the Redbreast Irish whiskey, though this does not last: the Lot No. 40 rapidly turns sour and slightly bitter as fruit notes (citrus) and rye spices take over. Finish: Pepper dominates here, with other spices and fresh oak lasting for quite a long time. Balance: From the sweet attack, through the sour and fruity middle and finishing with the peppery and spicy finale, this is a very interesting sipper. It is not the most balanced and it is rather aggressive, which some might not like, but I would recommend trying it. Will I be buying it again? It is certainly a very interesting whisky (especially for a Canadian whisky) and it can easily be win a permanent place in my cabinet. I do prefer other Canadians (Wiser's Legacy and the Forty Creek Pot Still Reserve), but both are quite hard to come by here in Québec. I can also see it becoming the base for some rye cocktails. All in all, I say it's a must try. Every sip seems to bring out something different. @Matthieu my bottle was first full of tropical notes and now it's moving to the floral side with a grappa note. I really like it but I think that is what you taste as sour, so I would advise you to drink it fast before oxygen turns it into a sour mash. We don't taste whisky the same way at all. For example, Forty Creek Pot Still Reserve is way to sweet for my taste and I don't like maple in my glass. I like the blast of orange in it and the price but I will not buy a new bottle. For me LO 40 IS OF STELLAR QUALITY compare to FC Pot Still. Merci pour l'offre. Je n'ai besoin de rien en ce moment, mais je la garde en note. When I first taste Old Potrero 18th Century style, my reaction was why Canadian rye have always the same profile, why Canadian rye can be that good?!!! Well, now I can say Canadian Rye can be that good! And be sure it is not patriotism since it is quite canadian to look at ourselves as good second level performer. But not this time! It is the first time I encounter such a ripe banana nose with that much spices, nutmeg and cinnamon. Wow! With the vanilla, you have a fantastic custard. When I add some Special K cereal and rose water, I am simply blown away. The palate is in line with the nose with even more ripe banana to which you can add a nice red tea and some plum. Fantastic! The banana and the floral notes are lingering for ever on the finish. What a surprise! The balance is there. It is a very coherent whisky with all the exotic notes you are not expecting from a Canadian dram. A very sweet dessert dram with maybe the best value you can find; that is, at least, in Canada where it is only 40$! 100% rye whisky is MY idea of 'real Canadian whisky'. Too bad it is not most Canadian distillers' idea of Canadian whisky. I will look for ripe banana the next time I have some Lot 40. I love ripe banana. Usually I find that oxydation enhance the ripe banana, that is at least for the 4 to 6 first months. So, hopefully, time is on your side. I am with you about the 100% rye whisky. May I add that I prefer when they hold the maple in leach. If they want to put the flag on the bottle that is fine with me; but, please, keep it out of it! AROMA: Delicious. Like dark caramel flan sauce with dark rum, spicy rye and cherry notes. ON THE PALATE: The arrival is dryer than the nose. Rye, cherry and oak at the top, with a flash of sweetness, then a long fading away of the sweetness into spicy rye and malt, with coffee at the bottom, earth and dry. And the cherry, always the cherry. SUMMARY: There’s a lot here to be contemplated. Great balance. Complex and rich, yet very drinkable. Tasting this whisky is a long, lingering spicy trip from sweet to dry. There is no age statement, but there is nothing obviously young about this whisky except perhaps the pleasant spiciness of the rye. A fine dram for those who like their rye complex and a little on the dry side. VALUE: At $57, and considering I was amazed to find it in NYC the other day, this is a pretty good value. Megawatt also did a review of this whisky back in October of 2012, which I entirely agree with. Here is a whisky that until now existed on in legends for me, since it was discontinued before I came to appreciate fine spirits. Now it has been reintroduced, owing no doubt to the resurgence of demand for fine Canadian whisky. The bottle delcares that it is a "single copper pot still" whisky, which is an unusual designation which seems to indicate a straight, unblended product. The label also states "made with malted rye", and "pure Canadian rye whisky in its simplest form." Interesting. Nose: from the bottle, it reminds me of American straight rye (or rye-heavy bourbon), but without the heavy oak char influence. In the glass I get an estery sweet-sour aroma, laced with spice. Some herbal aromas emerge in time. Also pine needles and sawdust. A heavy aroma for a Canadian whisky. There are traces of the typical caramel and vanilla, but these are overwhelmed by the intensity of the rye. Taste: Quite aggressive without seeming harsh. Rather it is big and oily, with a big sour dough sort of flavour that coats the tongue. I don’t find this whisky even remotely fruity. Instead the sweetness is of hard candy, like crunching a Wurther’s with a mouthful of hot spice. Finish: a flawless finish in my book. Very long and smooth, fading on just the right notes. Pleasantly tangy. Balance: in many ways, a whisky-lover’s whisky. It gives us whisky geeks a good chance to experience unadulterated rye, and helps us recognize and appreciate that grain’s influence in other whiskies we love. On top of that, it is an uncompromising whisky that delivers on all fronts, and is extremely drinkable. If anybody ever asks for "the good stuff" in Canadian whisky, this is it. Unbelievable. Couldn't agree more. And a great price point to boot!